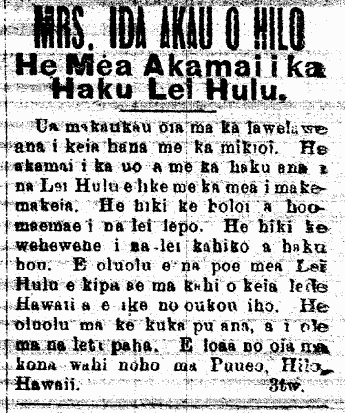 Hilo feather lei maker Ida Akau, 1901. A Person Skilled at Making Lei Hulu. She is proficient at this work with fine workmanship. She is skilled at tying feathers [uo] and putting feather lei together [haku] as per one’s desires. She can clean soiled lei. She can undo old lei and remake them. Those who have Lei Hulu, pleace come and visit the place of this Hawaiian lady to see for yourselves. Consultation by visit or by correspondence is welcomed. She can be found at her residence in Puueo, Hilo, Hawaii. Ke Aloha Aina, Buke VII, Helu 45, Aoao 3. Novemaba 9, 1901. This entry was posted in Advertisement / Announcement, Featherwork, Lei and tagged feather lei, Ida Akau, lei hulu by nupepa. Bookmark the permalink.